ZGF Architects have designed a vibrant new workplace for premier healthcare brand, Cedars–Sinai, located in Los Angeles, California. The new office is on the 20th floor and co-locates three separate, non-clinical business units that form a key part the of organization’s leadership team. Representing a substantial shift in their corporate environment, the three different departments housed within the space have not always worked in proximity. A number of interactive visioning sessions informed the design of the space. Overwhelming group consensus and a strong collaborative culture resulted in bright, glass-fronted private offices pulled off the building perimeter in favor of large spans of open work areas. As a result, both open space and offices are flooded with natural light and have access to expansive views across the city. The brief for the new office also called for a variety of workspaces to encourage employees to get away from their desks and collaborate, making acoustical solutions a necessity. 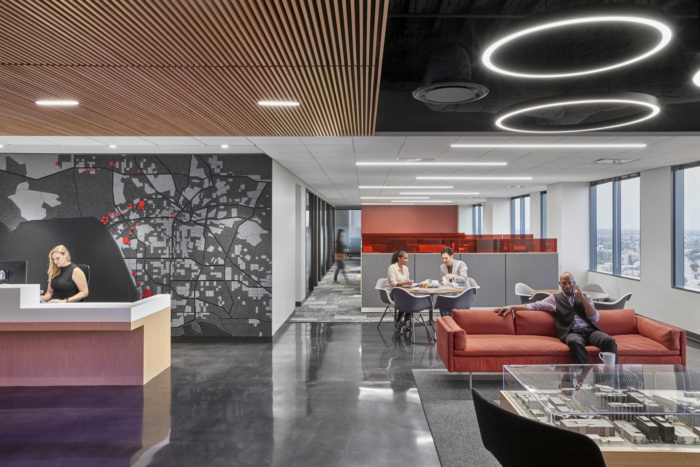 A large felt light fixture installed above an open breakaway space provides one such integrated design solution, softening the buzz of colleagues connecting while adding visual interest. A central work café offers a variety of seating options for breaks and informal meetings, from traditional tables to bar and coffee table seating. A trio of bright red booths are great escapes for a bite to eat or to touchdown with a laptop for a change of scenery. ZGF designed and fabricated custom environmental graphics for the new office to establish a branded space for Cedars-Sinai and to showcase their newly updated signage standards. Visitors entering the lobby are greeted by a reception desk behind which is a custom, floor-to-ceiling map of the Greater Los Angeles area. Created using multiple shades and layers of grey felt, the neutral tone of the map is contrasted with circular red acrylic pins of varying sizes indicating all Cedars-Sinai locations. Beyond the reception area, a simplified and abstracted version of the Los Angeles map becomes a statement piece on the conference room glass, serving both as a graphic reference to Cedars-Sinai and as a privacy feature for meetings and conferences. Opposite the reception desk is a 14×9 FT LED art installation consisting of a wood panel perforated by 2,500 medical-grade centrifuge tubes and backlit by 3,500 color-changing LEDs. Programmed to an algorithm based on harmonic resonance, the ever-evolving artwork never displays the same color combination in the twice in 24 hours.